Much more than your traditional library, this Elgin institution is investing in learning activities, programs and exhibits for kids and adults. 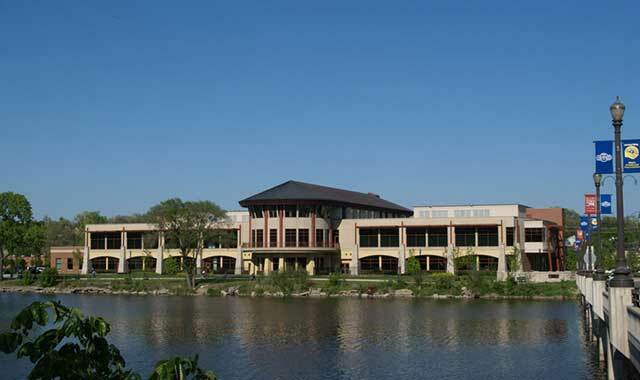 Gail Borden Public Library’s main branch, in Elgin, attracts out-of-town visitors with activities, events and a fantastic view of the Fox River. Most cities have a library, but few are as impressive as the Gail Borden Library in Elgin. Each of its three branches has activities for visitors of all ages. Walking in the main library at 270 N. Grove Ave., you never know what you’ll see – maybe a robotic giraffe, maybe a collection of Star Wars action figures, or maybe even a 32-foot tall dinosaur skeleton. It’s not unusual for out-of-town visitors to stop by. The main library gets 2,500 to 3,000 visitors per day. About 145,000 residents are served by the three libraries: the main branch downtown, the Rakow Branch at 2751 W. Bowes Road, and the new South Elgin Branch at 127 S. McLean Blvd. According to Raleigh, 72 percent of people in the district have library cards. Right when you walk in the main library, a “marketplace” of popular books, movies, CDs, video games and other media awaits exploration. Nearly 60 percent of the collection is checked out at all times. Gone are the days when books are checked in manually. Now, a 23-vent sorter immediately registers when items are returned. The result is that people never have to wait to check out new items, and returned items are usually back on the shelf within the hour. The staff members who used to manually check in material are now out on the floor, helping the thousands of visitors find what they’re looking for. Walk past the marketplace and you’ll quickly discover what appears to be a playground. Crafts, puzzles, puppets and games are dispersed amongst a trove of children’s books. Just a few steps away is a Middle School Zone, where kids in grades 6 through 8 can play Minecraft, participate in Magna and Anime Club, or work on school projects at grouped tables. The first floor also contains a cafe, a 200-seat auditorium and a computer area. Besides using the computers for research or recreation, adults can take classes in both English and Spanish to gain computer skills, while students can take classes to learn coding sills. Upstairs, the library offers activities geared toward teens and adults. Teens can relax, play games or collaborate on homework. There are walls that they can write on and comfy chairs where they can sit and plug in electronic devices. A craft table has many types of supplies to finish school projects, while an audio/visual media studio has technology the teens may not have at home. The second floor contains many shelves of books, but it also has the library’s genealogy section. Perhaps the most popular area of the library is the River Room at the very back of the second floor. Since the library is located off the banks of the Fox River, the River Room provides library visitors with gorgeous views of the surrounding landscape. In the wintertime, people enjoy sitting close to lighted fireplaces and watching for eagles outside the window. Though the main library has the most amenities, the Rakow and South Elgin branches boast their own unique features. At Rakow, visitors can find a 24-hour MediaBank DVD dispenser, a computer cafe, Science Saturday events for middle school students as well as programs for all ages. The South Elgin branch has an abundance of collaboration areas and study rooms, in addition to a laptop dispenser for computer usage. What Else Does the Library Offer? Combined, the three Gail Borden branches hosted more than 2,000 programs in the 2015-16 school year, with 69,450 people participating. One program that particularly stands out is Read to Rover, a program at the main branch that invites certified therapy dogs into the library so elementary-aged children can read aloud to them. Proficient readers and struggling readers alike enjoy participating, Raleigh says. Bueche finds that Read to Rover can also be a great way for parents to introduce dogs to their children. Read to Rover occurs the second Saturday of every month. Children can bring their own book or pick up one at the library upon arrival. Spots may be available on the day of the program, but advanced reservations are encouraged. In addition to programs, the library often hosts exciting events. For example, this past year kids had the opportunity to speak live with astronauts on the International Space Station. All branches have lists of fun upcoming events, from the 12th annual Black History Family Festival to concerts from the Elgin Symphony Orchestra. Sign up for programs or discover more information on events at gailborden.info. This entry was posted on Wednesday, December 7th, 2016 at 12:00 pm	and is filed under Mind & Spirit, Top Posts. You can follow any responses to this entry through the RSS 2.0 feed. Both comments and pings are currently closed.